Geeky, nerdy, dorky, whatever. All things technical and well, nerdy. Fun – though I think the java tried to freeze my Firefox and I had to use IE. But so pretty! And customizeable! Here’s one of an entry I did a while ago (last NaBloPoMo). First, and unrelated: this is a great post about toys, buying, making, all those concerns brought up by recalls lately. I know it’s old, but still good — and I wanted to save it on my blog. Read it. I am a definite PZ4 — a term I first heard here, and I find it positively endearing, so dorky and intellectual and perfect — a fantasy/scifi fan. I read Lord of the Rings (including the appendices) for the first time in fifth or sixth grade, and then scores (possibly hundreds) of times after that. In eighth grade we had to make a newspaper (ah, the basically pre-computer days still, no desktop publishing programs, just cutting and pasting onto big sheets of paper — though I did include a few pixelated graphics/clipart) and mine was the Hobbiton Herald. It was awfully fun to do, too — making up ads for hobbit holes and wagons, lost and found classifieds, articles about arcane pieces of hobbit history (some of it from the appendices of the books, some that I made up myself). So much in my sense of how-a-story-should-be, especially anything fantasy, was shaped by Lord of the Rings. For example, I can’t stand it when the pace is TOO fast, when the characters never get to eat or rest, ever. I don’t find it exciting, it just exhausts and unnerves me. Chalk it up to all the Tolkien in my formative years. In fact, in my early English literature class in college we read Beowulf in a prose translation. Something about it — not the story, but something — seemed so familiar to me. Eventually I figured out that it was the rhythm, the style of the language — it was just like Lord of the Rings. (Tolkien the tremendous Old English scholar, go figure.) And so when I took an Old English (the language) class my junior year, for the final translation project I was one of only two people in the class to choose to translate something in English into Old English — I picked various poems and riddles from the Hobbit and Lord of the Rings. It was sort of almost easy. Kerflop talked a little in that entry above about finding Twilight et al more “believable” than most books of its genre, that maybe that was why she liked it. Now, just about all of the fantasy/scifi I read, I would say is “believable,” as far as characters experiencing a story goes. (Some of that is in how well it’s written, I suppose, and of course it varies depending on the book, just as it does in any genre, including “mainstream” or whatever the heck you want to call it. I like to think this means my taste is impeccable, though I suppose it could just mean my standards are low and I am easily drawn into a story. Not so much now though, now that I am a crochety adult.) Of course, the world they inhabit is not always (in fact, usually not) ours — and for most PZ4s that is a major part of the appeal, gradually discovering and finding out about the fantastical world. Maybe for those who aren’t usually “into” fantasy that’s why Harry Potter (and apparently these Twilight books) are more accessible, because they start in the “real” world? Even if later they basically segue into something completely different (the wizarding vs. Muggle world, etc). But maybe they can still refer to familiar reality as well, something that a lot of fantasy (Lord of the Rings for example) can’t. Hmm. It’s funny actually, so many things, especially TV and movies, are now incorporating scifi or fantastic elements in them, that people are much more familiar with that sort of thing than they used to be. I am (not so?) woefully television-ally ignorant, so I’m hardly one to start making a list, but there’s the overtly fantasy shows (like Heroes) and those that are more subtly so (Pushing Daisies? ok, that’s pretty overt, or so it appeared from the five minutes I saw the other night; but LOST, there’s a good example). “Science fiction” is so often fantasy anyway, the magic is just done by pushing a button instead of by waving a wand. All stories are pretty much fantastic, more or less, I suppose that’s what makes them fiction (and yet we all know those true stories that are really stranger than fiction, that you would never accept in a movie without rolling your eyes, and yet they happen — what does THAT say?). Fantasy is the easiest thing to write, and one of the hardest to write well. It is hard because good fantasy, like good art, demands that we depict what we see. And not what we “know” to be “true.” I once put a witch and a private detective in the same book, and I have been told ever since that I am not to do that by people who will not see that the private detective and the witch often live in the same block. The universe is extensive, and time wider than any sea; it is our good fortune, Horatio, to live at a time and in a place vastly richer than most in those things that are not to be found in your philosophy. My editor says, and says truly, that he has become the man he wanted to be as a child. I, too, have been fortunate. As a child I wanted very badly to have adventures and go to Oz. I have had many and look forward to more; and on the tenth or it may have been the twentieth occasion that I watched Bert Lahr rescue Judy Garland from the pigs (the newspaper I read every day does not even know that pigs are dangerous) I realized that I was born here: Kansas is black-and-white, and that’s not where I live. Not so long ago I saw a magnificent German shepherd lunge from between two parked cars, held in check by a blonde who could have played first base in the National League. And it struck me that a fantastic adventure could have been filmed on the spot simply by hanging a skull about that woman’s neck and equipping her with a broadsword – but the woman and her dog are everything, while the skull and sword are nothing. Fantasy is life seen whole, and reading fantasy enables us to do it. (I will not say “only life seen whole,” because life includes all that is and is not.) We have heroes and heroines, castles and curses, seers and sorcerers, angels and alchemists, and invisible airplanes. We have that woman and her dog and a million more wonders, and all that is necessary for fantasy is a visitor from Kansas. Technically, all fiction is fantasy. It hasn’t happened in “real life”; it has been invented. But there is a divide between fantastic literature and other, more realistic fiction. Most fiction is like a pane of glass, a window that we look through to see another view of the world outside ourselves. It is not a tale of real events, but it looks real. Fantastic literature is not merely not-real, it is aggressively not-real. The events in a fantasy novel are not simply things that have not happened; they are things that cannot happen. Dragons and unicorns exist only as metaphors, and the daylight world suffers a serious shortage of magic swords and flying carpets. Thus, fantasy does something different from realistic mainstream and historical fiction. Fantasy takes the window and coats the outside with the silver of wondrous impossibilities – elves, dragons, wizards, magic. And the window becomes a mirror that reflects both ourselves and all the things in the shadows behind us, the things we have tried to turn our backs on. More: In the best tradition of magic mirrors, fantasy reflects not only ourselves and our shadows, but the truth of our hearts. I think this is one of the reasons some people fear fantasy. The laptop obsession only grows. (It’s particularly bad whenever I have a scrapbook crop coming up.) I got a birthday check from my dad that helps in the cost department. The real problem is not even so much the money (which I would probably blissfully, if unwisely, ignore in a hot second), but more the fact that I appear to be something of a technological heel-dragger. This is totally me. My dilemma comes from not being ready to upgrade (questionable term in this case) to Vista yet. Mostly because Photoshop Elements 3.0 (yeah, yeah, I know 6.0 is out now, what’s yer point) doesn’t work with it at all. So I’m looking at possibly getting a laptop, then wiping it and installing XP. At least for now. I don’t know. I feel a bit stymied. I could just take the plunge, and upgrade Elements at the same time. (Though I’m concerned about sharing a catalog or whatever between two computers, with two different versions of the program.) But also I’ve been making such huge leaps (for me) with PSE lately that I just can’t bear the thought of having to learn a whole new program right now. Okay, not ALL new, but y’know what I mean. For fun, I will list some of the things I have learned recently. Yes, some of them are no doubt painfully obvious basic things, but hey, I’m finally feeling comfortable enough with it that digiscrapping feels easy, instead of somewhat laborious like it used to for me. How to drag files (like photos) into another file (like a layout) in the editor: hold down shift and drag from the main window down to the second file in the bar below. How and why to use (at least somewhat) adjustment layers — totally awesome. Now I can add and adjust pattern texture to a background color to make it look like textured cardstock (pattern fill adjustment layer > Dark Coarse Weave (under Artist Surface) > adjust scale (I’m using 100% for my 8×8 reunion album, I heard 270% is good for 12×12), set the blend mode to Overlay, and adjust the opacity till it looks good (I’m using 25% at the moment). Also I can adjust the levels on a photo AFTER I’ve already put it onto my layout – yay! Starting to learn a little about blending modes. At least about the possibility of experimenting with them. Using the Shape tool to create my own templates — which I really love doing. Batch process multiple files with the editor — turn a bunch of .psd layouts into .jpgs. This is especially cool when I’m doing a whole album and finishing several pages at once — so much less laborious! Also you can add a watermark, though if you don’t want one, you have to DELETE THE TEXT, else you’ll end up with it on your to-be-printed version photo. Oops. Cutting masks (Ctrl-G), linking layers, merging 2 linked layers (Ctrl-E): all this is so useful for digiscrapping. How to organize and save my brushes into sets with the Preset Manager. Also how to make (define) brushes. And getting a little more comfortable using them. Have done some pretty cool things with adjusting the lighting in backlit photos. Also moved my brother’s head closer to my dad in one — wish I could remember just how I did that. It involved lots of copies of the main layer, probably more than were strictly necessary. But it sure did come out perfect. Of course, my third child is my main Christmas gift this year. However, I got some lovely vouchers-for-money-off-next-purchase-type-things in the mail shortly after getting my camera, and you can’t just let them EXPIRE, can you? Of course not. So I went and got a tripod for a ridiculously low price. 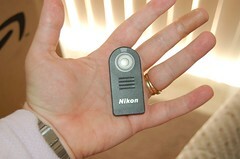 And, to go with it, a wireless shutter remote from Amazon. I was picturing something more like a TV remote, y’know? But look at it – it’s so tiny! So cute! So easy to lose! Good thing there’s a handy pocket just the right size for it on the outside of my camera bag. But still, I’m considering wrapping it in neon tape… I played with it some last night – lots of fun. You push the button! And it takes a photo! Dude! Normally when upload photos I take the memory card out and put it in the card reader on the computer. That evening it was giving me trouble, so I dug out my cable and hooked the whole camera up to the USB port. Then I discovered that the K: drive (new external hard drive) wasn’t letting me write to it. AND WASN’T SHOWING ANY FILES ON IT. As in, all our video and photos. I last did a backup onto dvd at the end of August, of pictures only, so not a single one from my new camera. And, if you recall, I had JUST DELETED the newest backup. Drive K: showed only three empty folders (though it still read as having 100 gigs of space on it used). Naturally, I just about lost my mind. I slammed into the bedroom where my husband was already in bed; he thought the sky must have fallen since I was totally disregarding the Sleeping Children Factor. Turns out he has a program installed that can recover deleted files, even ones that have been emptied from the recycle bin (or in the case of the backup, were never put there at all because they’re so freaking huge). So first we recovered the backup, just in case. Then I restarted the computer. The files showed as being there upon restart, but then disappeared again. Eventually I figured out that (I think) it was having the camera plugged in that was causing the computer not to be able to read drive K. Whatever crazed system it uses to decide what letter is assigned to each drive/port/whatever is definitely confused, and thinks that both of them are K, and therefore doesn’t read the hard drive when the camera is plugged in. (It doesn’t give me this problem when I use the little flash drive in the same port, though. Hmph.) We’ll see what we can do to fix it, but meanwhile? Vast relief. I’ve solved part of my problem by taking all the video out of my regular PSE catalog and putting it into its own (since I don’t do a lot with it I don’t need to back it up as often, whereas the photos are constantly changing), which helps a little with the vast file size issue. I’m also jumping back in with both feet to uploading to Winkflash — I have all my photos on there up till September and the new camera, then I was temporarily stymied by the new profusion of photos and how to organize them in a workable way, and am way behind. No more! And then, as if you aren’t already trying to figure out a way to go back in time and kill Lucas’s great-grandfather, we get “midichlorians” sprung-on us, the ridiculous “mastery of the force has a biological component” claptrap that is second only to “Greedo shot first” in the litany of Wrongeheaded Star Wars Revisionism. Brilliant, brilliant, brilliant. Don’t you just love it when you find something that perfectly articulates what you ardently believe? Yeah, me too. For the record, I don’t own the prequels, and I don’t think I ever will. I only just recently bought the originals on DVD, when they finally released the real editions. I am, perhaps, a bit of a purist. The Star Wars saga seems to have been the dream of George Lucas’s childhood. In his mind’s eye he saw great starfleets in battle, mighty armies sweeping their enemies before them, ruthless politicians outmaneuvering each other, and in the midst of all, the powerful Jedi knights, each one the match for an army, wielding the power that lies hidden within the fabric of all life in the universe. Lucas saw one child, born in an obscure corner of the universe, but touched with power and shaped by destiny. He did not know who fathered him, but he was adopted by the Jedi and trained to be the mightiest of them all. Alas, he turned to the dark side of the force and became the tool of pure evil; but a son and daughter conceived when he was still within the circle of the Jedi would grow up to defeat his master and liberate him from the darkness that had swallowed up the goodness that was always innate within him. It was an epic of breathtaking scope and George Lucas could not forget it. […] He wanted to make his epic dream come to life on the screen, in all its majesty and power — and humor, and love, and heroism, and sacrifice … He labored over the special effects to make it all seem real, and he succeeded. The dream of his childhood was there on the screen. Too bad his inner child never learned how to write. Find things in the weirdest places. While looking at something random on Wikipedia, I clicked on the entry for Jazz Hands. Amusing. But at the bottom of it, a reference to an online game that also sounded amusing. And is it ever. Could there be anything dorkier than this? Once More With Hobbits – a Lord of the Rings parody of “Once More With Feeling”, the Buffy the Vampire Slayer musical. I know, you’re gasping from the waves, the layers of nerdiness. Just keep breathing. And do I love it? But of course.